Larry Dunstan’s photography centres on notions of beauty and perceptions of what are stereotypically seen as ‘normal’. Of the various pictures, some are photographs of disabled people and some are of able-bodied people that have been made to look as if they may be disabled. By juxtaposing these pictures, Larry questions prejudices by forcing viewers to ask themselves how they view people. Larry also seeks to explore how disabled people are represented in popular culture media such as advertising and fashion. His works mimic fashion photography in his layout, styling and poses. The large inklet prints, mounted on compressed foam are pretty much in your face. The uneven lighting doesn’t do the photographs justice, was my first thought as I’d walked from picture to picture, identifying the ‘disability’. It then occured to me that the word ‘disability’ needed different reference points. To most Singaporeans, being abled as opposed to being disabled is usually defined by insurance policies and its contraries, and MINDEF Physical Employment Standards (PES) status. It is often taken for granted and any converses mis-understood. I thought the treatment of the pictures taken were quite fashionable, like what you will find in lifestyle magazines. Aren’t they? By dissecting the word ‘fashionable’, we can understand an inherent discomfort when we view the work. We are used to seeing pretty, usually skinny models for advertisements, but not those seen here. The artist has chosen to parade their appearances, celebrating their physical disability. Or are the models being made use of? The only criticism I have is the power play between the photographer and model. A good reference will be Diana Arbus, famous for her mental or physically handicapped series of photographs. Did the photographed have a say in the composition and mood of the image? Did Arbus understand the shock, sensational value of her work that draws her audience? Can the idea of ‘freak’ and ‘beauty’ ever be reconciled? When and where can one look beyond the disability and find other abilities, like what Singapore’s Very Special Arts tries to engage with? 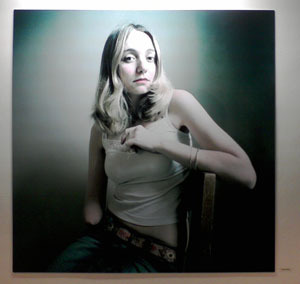 I think this work really provokes the audience to consider their own position and views of disability. Coincidental enough, the Straits Time feature story on January 20, 2007 Saturday is about social workers in Singapore, professionals that help Singaporeans cope with living and moving on, disability or limited ability. Disability comes in many forms, not just what is on exhibit. Prejudice runs deeper when we examine ourselves. Not contributing to the community, even in littlest ways, and being uncaring is perhaps a disability we should face and do something about. 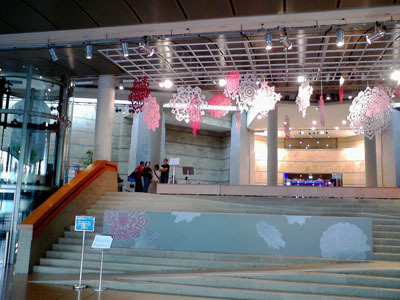 Eric Chan’s recent installation at the Esplanade Concourse can best be described as largely sized papercut-look alikes, hanging hap-hazardly. the sizes are hardly varied, the lighting ill-considered, and a thin link to paper-cut as a traditional decoration, or at best over-sized wrongly coloured snow flake post-christmas decorations. Of course, I didn’t read in between the lines of the synopsis or write-up, and the work’s conceptual link to ‘desire’. The individual hanging pieces are hardly as interesting as those by American sculptor Alexander Calder. Calder’s works are interesting because his hanging mobiles move with the slightest breeze, and the sculpture changes form like the clouds on a sunny day. The ‘springtime’ work can barely shiver in the cool controlled air-conditioned concourse, remaining stagnant. The individual pieces are very well made, probably from alloy, from the way they are hung. The pieces are too few, and a variety of sizes may have benefited the space in its multitude and illusion of depth. Light seem to be key to extend the shadows cast from the pieces onto the floor, and the ‘printed shadows’ on the platform of the staired councourse thus look hideously out of place. Colour could be symbolic and crucial here. We should know the Chinese love red, and red here links the work to the red used profusely during Chinese Lunar New Year Celebrations. It is debatable if the work could look ‘lighter’ by coating them white, and allowing a flux of changing light – from white to red and back – playing with the audience perceptions of Winter’s transformation to Spring. Having it in shades of pink, and red just doesn’t quite cut it. The long standing tradition of Chinese Paper-cuts prides precisely on it’s delicate medium – paper. Alloy here defuses the image of the individual craftsman, and summons the industrial processes of minimalist art. The work could have been potentially more interesting if more illustrative paper-cut-like storytelling were used, considering satire, some historical fable, anything. The work would then have more intellectual depth, beyond it’s current frivolity matching the decorations in the ‘exhibition cones’ outside the Esplanade shops. I’m comparing this work to Heri Dono’s Angel Garden installation, a piece in collaboration with Lina Adams and Jeremy Hiah in 2004 in the same location. Hiah, Adams and Dono’s Angel Garden was more colourful, engaging, allowing the audience to touch, feel and imagine. This in comparison is sterile, utterly dislocated in the daylight. Nonetheless, I do givea small virtual pat on the back, for trying something different from the artist’s stable of animal chirpy paintings. Exhibitions within this below average range puts this exhibition last on my list of things to do. E.g. Work, do administrative work, prepare for lessons, Paint, coffee, laundry, television, go for a stroll in a park and only if I have TOO much time, I will see this one-star rated art exhibition again. Exhibitions within this average range are worth seeing if you know the artist or happen to be in the area. Exhibitions within this satisfactory range are worth seeing, especially if you follow the artists’ works. The exhibition is curated. E.g. it has an overall theme or concept behind the exhibition, rather than an eclectic mix of rojak works. Exhibitions within this very good range are worth making the extra effort to visit. The exhibition is well curated, and well organised with consideration for supporting events. E.g. Dialogue sessions, art education support. Exhibitions within this excellent range puts this exhibition as ‘make appointment with friends now’, ‘must see’, and would warrant a re-visit. The exhibition is excellently curated, the site is well thought through, and the show and supporting events are superbly well-organised; with friendly museum or gallery staff to answer queries. Not all exhibitions are covered! 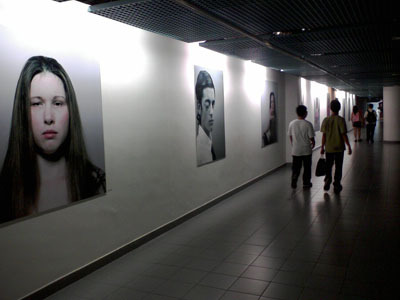 There are different types of exhibitions an artist in Singapore can take part in, (possibly in order of natural gutsy progression) ranging from graduation shows, singular installations within campus or public solo-window-display type exhibit; group shows, curated commercial (group or individual) shows, curated group shows, invited group shows such as Singapore Art Show, M1 Fringe or ‘equivalent scale art event’, Singapore Biennale, Venice Biennale, Documenta or other large-scale international Biennales. The scope of the review covers only local public exhibitions, and not art you do in your studio unless it’s a public open studio. Artists may not have all the control over how their works are seen and the rating may seem a bit unfair for artists. The ratings are meant for the exhibitions, and not to be taken personally. The rating system at the end of the review is derived from a compulsion to place a numeric value, for the art audience who just wants a quick gauge to determine whether an exhibition is worth seeing. Over time, the discerning reader will understand the angles I take, and gauge for themselves the intrinsic values of visiting art exhibitions, and ignore the ratings. Should my ratings be a bit overboard or rubbish to begin with, the reader should ignore it.